President Donald Trump opened a summit with Russian President Vladimir Putin on Monday by predicting that their countries will end up having "an extraordinary relationship" but without mentioning Moscow's meddling in the 2016 U.S. presidential election in his opening remarks. "Our two countries, frankly, we have not been getting along well," Trump said as he and Putin sat down at the Presidential Palace in Finland's capital. "I really think the world wants to see us get along." Putin, for his part, said he and Trump have maintained regular contact, including talking by phone and meeting at international events. Speaking through a translator, the Russian leader said "the time has come to have a thorough discussion on various international problems and sensitive issues." 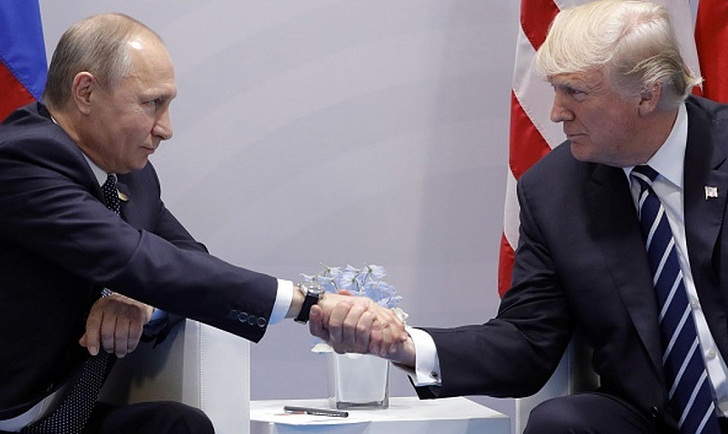 The summit got under way hours after Trump blamed the United States, and not Russian election meddling or its annexation of Crimea, for a low-point in U.S.-Russia relations. The drama was playing out against a backdrop of fraying Western alliances, a new peak in the Russia investigation and fears that Moscow's aggression may go unchallenged. "Our relationship with Russia has NEVER been worse," Trump tweeted Monday morning, blaming "many years of U.S. foolishness and stupidity and now, the Rigged Witch Hunt!" The summit, which was being closely monitored by rattled world capitals, was condemned in advance by members of Congress from both parties after the U.S. indictment last week of 12 Russian military intelligence officers accused of hacking Democrats in the 2016 election to help Trump's presidential campaign. Undeterred, the American president was set to go face to face with Putin, the authoritarian leader for whom he has expressed admiration. The summit started late because Putin arrived in Helsinki about a half hour behind schedule in another display of the Russian's leader famous lack of punctuality. Trump seemed to return the favor by waiting until Putin had arrived at the palace before leaving his hotel. Putin has been late for past meetings with the pope and British Queen, among many others. Trump and his aides have repeatedly tried to lower expectations about what the summit will achieve. He told CBS News that he didn't "expect anything" from Putin, while his national security adviser said the U.S. wasn't looking for any "concrete deliverables." Trump told reporters during a breakfast Monday with Finland's president that he thought the summit would go "fine." Trump said he and Putin would discuss a range of issues, from trade to the military, along with missiles and China. They shared a brief handshake before reporters were ushered out so they could begin their one-on-one talks in the palace's opulent Gothic Hall. They'll continue their discussions with an expanded group of aides and over lunch in the Hall of Mirrors, once the emperor's throne room. The leaders will conclude by taking questions at a joint news conference. Observers have raised concerns about the fact that the leaders will be alone during their first meeting, but for a pair of interpreters, meaning there will be no corroborating witnesses to accurately represent what was said during the conversation. The meeting comes as questions swirl about whether Trump will sharply and publicly rebuke his Russian counterpart for the election meddling that prompted a special counsel probe that Trump has repeatedly labeled a "witch hunt."